This article is about priority in relation to controller ports. For attack priority, see Priority. 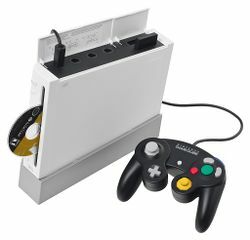 A Wii with its GameCube controller ports exposed. P1 to P4 are arranged from left to right. Port priority (also known as controller slot priority) is a set of rules that determine the outcome of certain situations between characters, during matches. These rules are based on the numbered player ports (slots) in which each player plugs in, or occupies with their controller, and these are represented by P1, P2, P3 and P4 with respect to the first, second, third and fourth ports. CPU players may also occupy these ports, and are affected by port priority in the same ways as human players. In the Super Smash Bros. games, the outcome of certain concurrent events, such as two characters being KO'd or attempting to grab each other simultaneously, are determined by port priority. In Brawl, port priority also influences the outcome of situations in which two characters are attacked during a grab, through an effect known as Faux Super Armor. As a general rule, as part of determining what occurs on every frame of gameplay, the game engine must iterate through all game objects to check and advance their state. This must be done in some order, which is often the earliest-created objects first; in regards to players, this generally means player 1 goes first and player 4 last. As a result, the game will always resolve player 1's actions before player 2's, potentially creating an imbalance if their simultaneous actions interact — unless the game is explicitly designed to account for each specific interaction. For example, say that player 1 and 2 are using the same character and attack each other with the same attack at the same time. A naïve game might check P1's hitboxes against P2's hurtboxes and resolve P1's attack on P2 before even checking to see if P2 is also attacking P1, resulting in P1 always winning the otherwise-even trade. This specific case does not happen, as all the Smash Bros. games were designed to anticipate this situation, checking players in muliple passes and using rules of priority to determine whether the players win, lose, or tie the exchange. However, many other situations have no such designed exceptions, and so port priority dictates which player "wins". Note that in the following sections, the "lower port" refers to whichever player is closest to port 1, while the "higher port" is closest to the last port (generally 4 or 8). In the first three Smash games, if two players attempt to grab each other on the same frame, the lower port always gets the grab. This is the case no matter what kind of grab it is, as long as the two players are grabbing each other on the same frame. Starting in Super Smash Bros. 4, port priority is no longer a factor in this situation. In Smash 4, the player who gets the grab is instead determined at random. In Super Smash Bros. Ultimate, a new mechanic is introduced that changes the outcome: in the event of simultaneous grabs, both characters take minimal damage and act as if grab released. In Melee, when a lower port throws a higher port, the higher-port character processes one frame of being in hitstun on the same frame of their release. This does not occur in the opposite case where the thrower is a higher port. As a result, all throws in Melee have one fewer frame of hitstun when used by a lower-port player, which can equate to an entire step in a chaingrab. This can lead to other lesser effects, such as Dr. Mario's down throw behaving differently on Mr. Game & Watch depending on who has the higher port. It is unclear how this situation resolves in other games. If two characters attack a third and both attack hitboxes are within priority range and connect with this character at the same time, the trajectory of the third character's knockback will only be affected by a single attack, not both. The third character will take damage from both attacks, but be projected only by the knockback of the attack from the player with the lowest port. If two or more characters attempt to grab the same edge at the same time, the character with the lowest port will grab the edge first. This is a very rare case, as characters have varying movement characteristics and edge-grabbing ranges. If two or more characters attempt to pick the same item up from the ground at the same time, the character with the lowest port will grab first and acquire the item. Note that different characters pick items up at different speeds; the time of the item grab is what matters, not the time of the input. Two characters that attempt to occupy the same space on the ground will jostle each other until they are separated. If two or more airborne characters attempt to land in the exact same place on the ground, the players with the lower ports always get pushed to the left. In Brawl, if two players attempt either to transform between Sheik and Zelda, or switch between the Pokémon Trainer's Pokémon at the same time, the player with the lowest port always finishes their transformation first. This issue is caused by the fact that Brawl loads these characters during gameplay, as opposed to before matches begin, and the Wii cannot load two or more characters simultaneously. Port priority determines the winner in certain cases of simultaneous KOs, including those that involve the use of suicide techniques. In this field, its influence in Melee differs from that in Brawl. In Melee, the outcome of simultaneous KOs during normal stock matches is not determined by port priority, regardless of their causes. However, when a match involving two players is tied and Sudden Death is initiated, if both players are KOd at the same time, the player with the lowest port wins the match. In Smash 64 however, the player with the highest port wins the match; matches won't even go to Sudden Death. In addition, Smash 64 ranks each player based on port; so in a 4 way tie P4 would get first place, P3 gets second, P2 earns third and P1 is stuck with last place. Unlike Melee, the winner of a simultaneous KO during a Sudden Death match in Brawl is random, and unaffected by port priority (aside from Kirby's up throw; where the player with the highest port wins). However, in the NTSC and NTSC-J versions of Brawl, it does affect the use of Bowser's Flying Slam as a sacrificial KO technique. If, during a stock match involving two players, Bowser uses Flying Slam to sacrificial KO on both players' last stocks, Bowser will either win or a Sudden Death match will be initiated. In this scenario, if the Bowser player's port is lower than that of his or her opponent's port, the Bowser player wins the match. However, if the Bowser player's port is higher, Sudden Death initiates. In the PAL version of Brawl, the use of Flying Slam in the aforementioned manner will win Bowser the match regardless of port priority. In Smash 4, if two Little Macs use KO Uppercut at the same time, only the player with the higher port will be hit by the move. This is the only instance of a move with transcendent priority behaving in this way in Smash 4. Faux super armor (abbreviated to FSA) is an effect in Brawl that occurs when both a grabber and the character they're grabbing are attacked by a third party at the same time. The game processes the lower port first, dealing damage and knocking them out of the grab. However, this breaks the grab and sends the higher-port character into their grab release animation. Having the grab broken takes priority over flinching and being launched, so while the higher-port player takes the damage, they are otherwise unaffected from the attack as the other player is knocked away. As a result, the higher-port player (whether they be the grabber or the victim, it does not matter) will receive "faux super armor" and gain a large advantage over the lower-port player. Falco (P2) grabs Ike (P3) and while Falco is holding Ike, another player, Lucas, attacks them with PK Freeze. Since Ike (P3) has a higher port than Falco (P2), Ike receives FSA, so he is released and takes damage from Lucas' attack, but is otherwise unaffected. Falco, however, will take damage as well as being knocked into the air and becoming frozen. Toon Link (P1) pulls out and holds a bomb. Lucario (P4) grabs him, and while he is holding Toon Link the bomb explodes. Lucario (P4) receives FSA and only takes damage, but Toon Link (P1) incurs knockback and a fire ailment from the bomb. Snake sticks a C4 onto Meta Knight (P2). Meta Knight then grabs Diddy Kong (P1), and uses his up throw. This causes both him and Diddy to rise above the stage, and while they are high in the air, Snake detonates the C4. Since Meta Knight has FSA, he falls to safety while Diddy is KO'd by the upper blast line, from the C4's knockback. This trick is nicknamed the "Omnigay" after Omni. In most cases, playing with the lowest controller port (closest to P1) is considered to be advantageous, as a lower port will allow a player to beat out their opponent if both attempt to grab each other or grab a ledge at the same time. Port priority allows the player with the lower port to hold the advantage in these specific situations, but these occur infrequently and are considered to have a minuscule effect on gameplay. Despite being advantageous, the lower port is generally not contested at the beginning of a set, as calling for port (or winning the rights to it, either by rock-paper-scissors or by scoring a higher number on Mr. Game & Watch's Judge) requires the player to give up stage striking advantage to the opponent. The stage chosen tends to have far greater influence in the outcome of a match than port priority, so players are generally content to give up port priority to the opponent in favor of stage striking. In mirror matches, port priority becomes more contested, as the neutrality of the matchup nullifies stage advantage. Doubles sets arrange team players in a "1221" fashion (with one team using P1 and P4, while the other team uses P2 and P3) to balance out the effects of port priority. The throw hitstun interaction in Melee can give an advantage to the higher port in rare cases, but this is such a little-known fact that it is generally ignored. However, in Brawl, due to the effects of FSA, port priority is of significant importance during competitive doubles matches, and singles matches that involve Snake, since he can summon powerful self-detonating explosives. Faux super armor can be used to advantage, if a player launches a powerful attack at a teammate holding an lower-priority opponent in a grab; the attack will hit both players, but the higher-port teammate will survive with no knockback, while lower-port player will be launched, allowing for easy KO setups. This can be seen in the notorious "Omnigay" technique, where a Snake player (P1) can stick a C4 onto their ally Meta Knight or Kirby (P4), and detonate it during the partner's up throw, killing the opponent in port P2 or P3 at any percent. In addition, if a Snake player gets grabbed while holding a Grenade, the hitboxes of pummels and throws are often enough to detonate it, and at high percents, this could result in the lower-ported player being KO'ed, while the higher-ported player survives. This can be exacerbated by Snake's immense survivability, as he can try the trick with little risk to himself at many percents. Consequently, additional rules are enforced in tournaments to ensure fairness. The losing side is allowed to choose ports for the next game, potentially creating a significant swing in favor of the losing player or team in a Snake matchup. The impact of FSA is significant enough to create slight imbalances in the Snake ditto matchup, where an unfavorable Hand Grenade trade can result in the lower-port player being KO'd while the higher-port player survives. As a result of FSA's effects, Snake is considered the only character to have an uneven matchup when fighting against himself — the Snake player using the higher port is considered to have a slight advantage. This page was last edited on March 1, 2019, at 23:54.